First and foremost, I can be a lazy developer at times (i.e. I’d rather use some templates provided by Xcode, just to save 20 minutes). So to start off, let’s create a new project using the Tabbed Application Template. You will see the App Delegate, Storyboard, and View Controllers for both tabs. The template also include icons for us (both for lower resolution iPhones, and the higher iPad, iPad 2 and iPhone 4). Delete the icons here, as some will be added later on, or keep them (If you want to follow this tutorial to the T, we will be adding some I created). 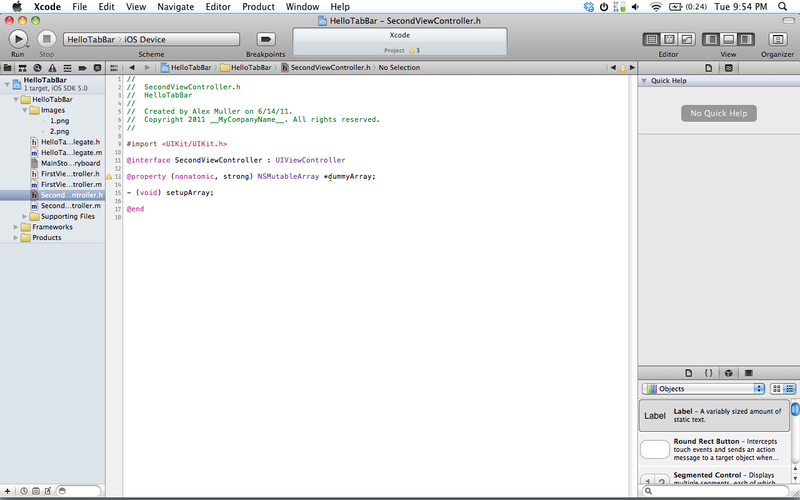 I really prefer the layout of this compared to the older Xcodes and their Tab Bar templates. It helps split everything up for you, and I feel it is less crazy when they are spaced out, since it helps you concentrate on one tab’s view at a time. If you wish to follow along, created a new group labeled “Images” and place images uploaded below inside. Lets focus on the First View first. Select the bottom part of the Tab Bar, navigate to the Attributes inspector, and change the title to “UIViewController” and the image to “1.png”. We are done with the first view. Since this tutorial does not really have much to do with UIViewControllers, we can just leave this how it is. Now we are going to get our hands a little dirty. First, scroll down to the Second View Controller and delete it. Don’t be worried, adding items to the Tab bar is painless. Now, go into your Objects on the bottom right, and drag out a Navigation Controller (the gold spherical one). You will notice that two windows will appear on the screen. The left one is the screen that actually contains the Navigation Controller, and the right is the Root Controller. The root controller is what you wish to display on the screen alongside the navigation controller. To do some minor tidying up, and to keep my OCDness at bay, I am going to change “Root View Controller” to “Table View”. Now, just because we have the Navigation Controller in the storyboard, does not mean it is connected to any implementation/header files whatsoever. So, let’s get the Navigation Controller all hooked up. First, Ctrl + Drag from the Tab Bar Controller straight down onto the Navigation Controller. You will notice that two options come up, viewControllers and performSegueWithIdentifier. Select viewControllers, and you will notice that you now have another tab added, and and arrow leading from your Tab Bar Controller to your new Navigation Controller. 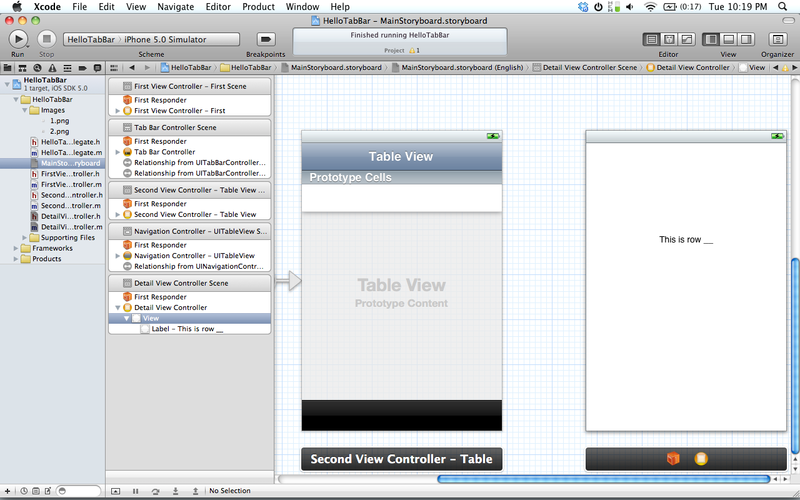 Be sure to also change the text to “UITableView” and the image to “2.png”. 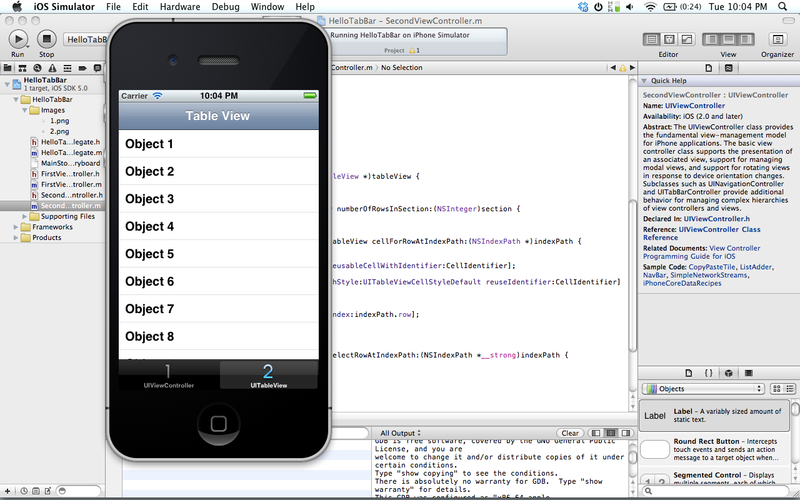 This now means that the table view will be getting it’s data from the SecondViewController.m/.h files. Before we get to programming, make sure you Ctrl + Drag from the Table View to Second View Controller – Table View and select both Delegate and Data Source. Without this, the data we create will not get loaded into the table view. Now, let’s actually start doing some programming! Since the Table View is getting its data from the SecondViewController files, we need to also write the delegate functions. Lets start with the SecondViewController.h file. We will be creating an NSMutableArray of dummy objects, along with using a setupArray function to create the array. I have learned that not much code should be done in ViewDidLoad, and that if you just have function calls it sometimes helps solve some problems later on. However, you’ll also notice that if you select a cell, nothing gets pushed onto the screen. This is because the didSelectRowAtIndexPath is empty, and I left it like that for a reason. The Apple developers in Cupertino changed the way the delegate function deals with views, since normally you would just pop a view onto the screen using a modal view controller or navigation controllers, there is a slight difference now. So lets go back to the storyboard file. So we will be using a View Controller as our detail view, so grab one out of our objects and place it next to the Table View Controller. Now if you click on the actual View Controller and go to the Attributes Inspector you will see something new: “Identifier”. This is basically a way to init certain views with certain scenes from the storyboard. Let’s just call this “Detail”. Now lets create some .h/.m files for this new view controller. Go to File > New > New File and select UIViewController subclass. Make sure the “With XIB for user interface” is not checked, and call it “DetailViewController”. 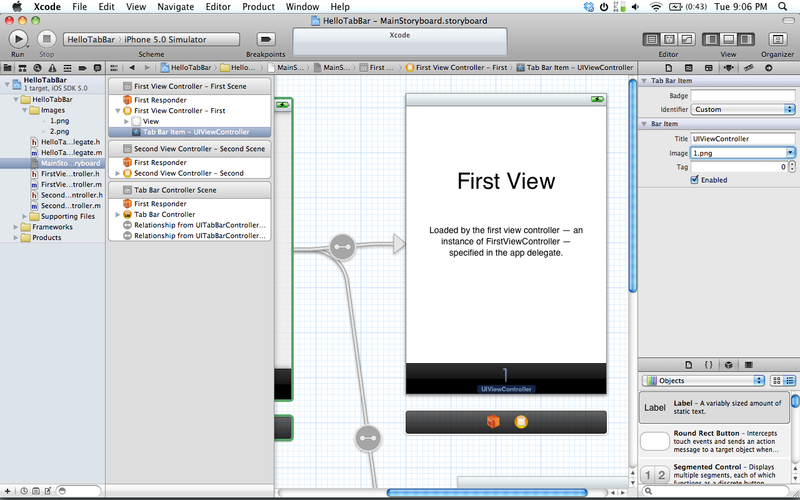 Now, go back to the View Controller we added in the storyboard, and change the class to “DetailViewController”. Lets go to the DetailViewController.h file, and add a IBOutlet UILabel. Also, do not forget to @synthesize the rowNum in the DetailViewController.m, as well as connecting the IBOutlet in the storyboard from Detail View Controller to UILabel. 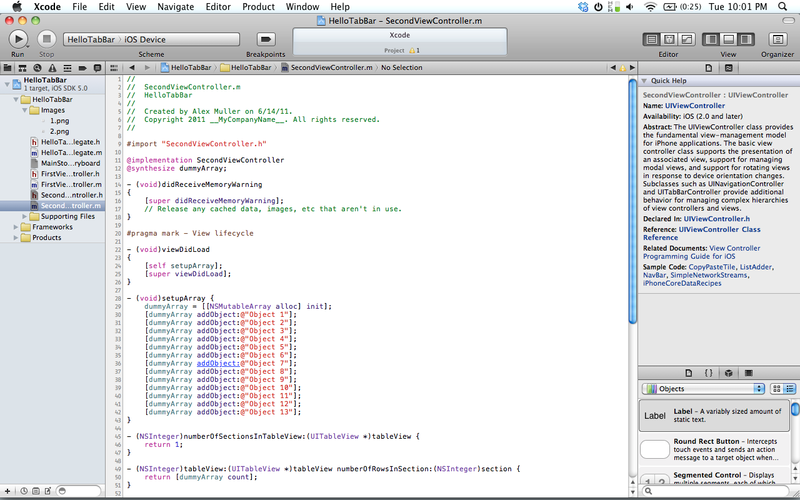 Alright, now to look at some new Xcode 4.2 functions. First, #include “DetailViewController” at the beginning of your SecondViewController.m file, after your initial #include. Lets look at the code I entered below, and I will try to explain it as best as I can. So if you begin to look at it, it looks pretty normal until you see the [self.storyboard instantiateViewControllerWithIdentifier:@”Detail”]; Well, I think the self.storyboard is obvious, you are calling this because this is the container for all of your Scenes (or nibs). 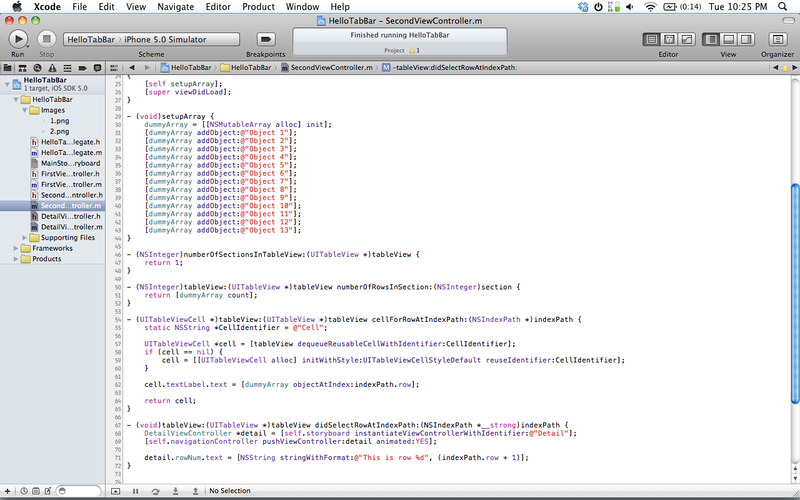 Now remember when we set the Identifier for our DetailViewController Scene? That was for this. I like to think of it as using an initWithNibName:, in that the Identifier is sort of like the scene’s name, and that is how they are associated within Xcode. Next, we just push the view with the navigation controller, followed by changing the text in each of the detail views to correspond with the row that was selected. And that should be it! I hope this was informative, and I hope you can use this knowledge again in the future. If you have any questions, please feel free to post a comment, and if you want to see the source code for reference, it is below. Also: I appreciate the amount of views I have been getting lately and it is making me overjoyed. Since I am in college, buying new gadgets to test on is nearly impossible. If you feel like I helped you, please spread the word and if you can, hit the “DONATE” button on the right hand side and donate a few dollars my way. Anything is greatly appreciated. Thanks for taking the time to write these out. I’m waiting for apple to approve my developer account so I can start looking through the new functions in the Xcode beta. Storyboards look amazing. These will definitely give me a good headstart. If you have any suggestions for future tutorials feel free to let me know. Is is possible that you can also add search function to the second viewcontroller? Thanks for the fantastic tutorial… One question though. When I run the app for the first time (after adding the code to populate the table) I get the following exception … “[SecondViewController tableView:numberOfRowsInSection:]: unrecognized selector sent to instance”. I’ve done the usual Google search, and the various results seem to suggest that I’ve wired up the DataSource / Delegates improperly, but I can’t seem to pinpoint the exact problem. Do you have suggestions on where to look? Make sure when you are hooking it up that you Ctrl + Drag from the Table View onto the Second View Controller (Yellow Icon), not the actual view. Also, if that does not help try looking at the source code I provided at the bottom, and comparing your numberOfRowsInSection with mine. You should only have “return [dummyArray count];” for returning the amount of objects in your array. If this does not work, try and upload either a picture, or send me the file and I will try to help you out. Really enjoyed the article and I’m excited to start using Storyboards more. I’ve been curious about some of the segue stuff (UIStoryboardSegue, prepareForSegue, etc..), however. Are these supposed to replace or enhance ‘didSelectRowAtIndexPath’ in any way? I’m wondering if they are supposed to be used as a ‘better’ way to pass data between controllers — also I like the idea of showing some sort of linkage between views in the the actual storyboard file; something that would basically say, “hey, your FriendListNavigationController is going to pass the name of your friend to the FriendDetailController.” Does that make sense? Thanks again! I am pretty sure that the prepareForSegue is something like setting up the view to push onto screen. I guess you call that delegate function and then you pass all your data there. That would be my guess, I would need to go look into it. How would I go about pushing a new view from my storyboard without using a navigation controller along with it? Look at the “Introduction to Storyboarding”. Pretty much you have a button on your first view, and you Ctrl+Drag from that button to your new view, and use the function “performSequeWithIdentifier:sender:”. Sorry, I should have been a bit more specific. I understand the Segue (awesome btw! ), in this specific instance I was simply trying to load another view in my storyboard after clicking a button that performs an action, in this case logging into a site. would be great to see a tutorial about the simple Master-Detail application. This is the same thing as in this tutorial. You create the array, and push the view onto the screen when the row is selected. I made (nearly) the same steps as you described here. Would be great if you can create a Master-Detail application on your own and provide me some hints. I have one more question: I have the simple Master Detai application. How can I pass the data from RootViewController (Table fruits) to the DetailViewController? Does this work when you try to use it? Is it possible to add XIB files to Storyboard ? 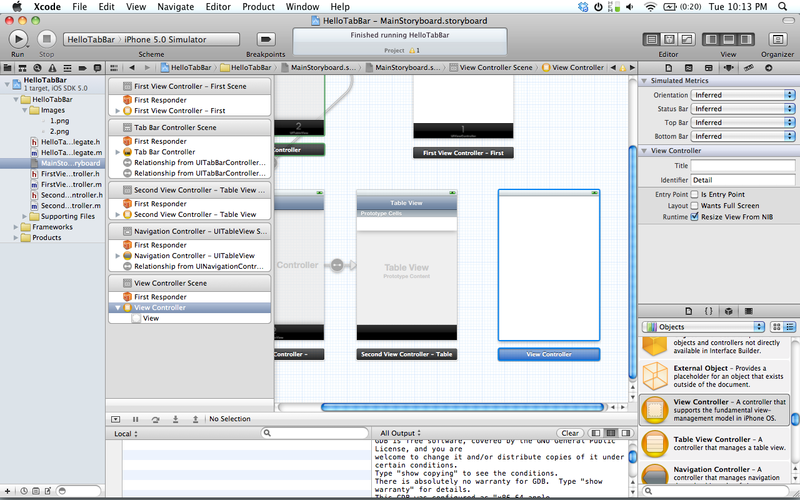 As in, if I have existing XIB files, ported from previous xcode project, and I want to integrate with new Storyboard ? Is that possible under InterfaceBuilder ? Or is that even possible programmatically ? Tutorial was great, thanks for posting it. I’m working on an app, and it really helped me out. I do have one question, i changed secondviewcontroller to a UITableViewController instead of a UIView controller and it causes the app to crash when i select the second view. Why is this? Could you please explain further what you mean by ‘…as well as connecting the IBOutlet in the storyboard from Detail View Controller to UILabel.’ ??? create a connection from the file’s owner to the UILabel, since we added a IBOutlet UILabel in the .h file. How can I create static table view cell in storyboarding. I need to display 3 label on the cell. Thanks! Thanks for these tutorials. 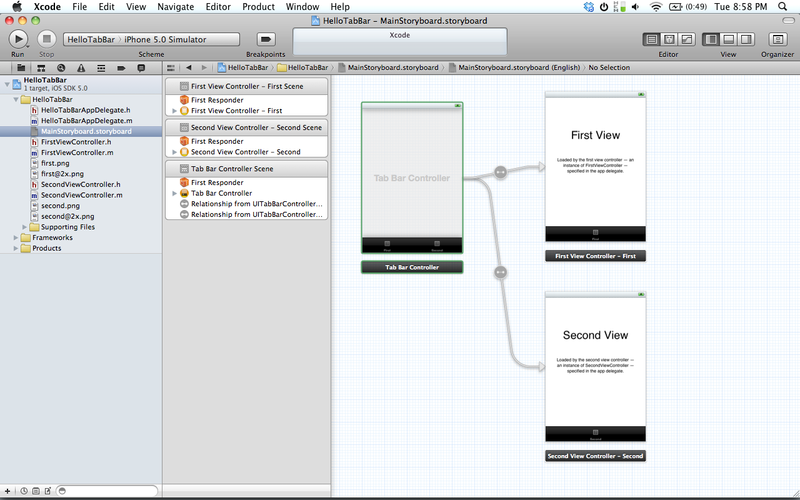 I’m new to iOS (and starting with xcode 4.2) and your storyboard tutorials have been perfect to get me started. I have encountered a problem – How do you use a storyboard and Table View Controller to create a custom cell layout. I can create a custom cell in the storyboard and get it to display in the table, but I cannot work out how to set the text on labels, etc that I added to the cell. hi, could you explain how to change the initial view controller. say, if created a navigation controller first, which is an initial viewcontroller in the storyboard, then add a tab controller, how to change the initial view controller to tab contoller, not th navigation one? Thanks. I have tried this and stucked with the weird one though.After did delegate and datasource connection to SecondViewController, in my SecondViewController.m i could not see many auto generating methods such as numberOfRowsInSection etc.,What might be the problem? Just because they aren’t “auto-generated” for you doesn’t mean you can’t add them yourself. 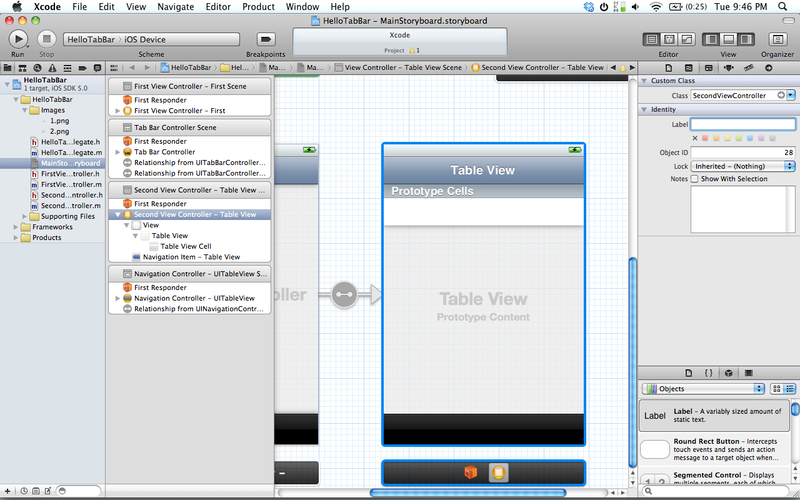 You have a standard UIView controller, those methods only come standard for TableViewController. 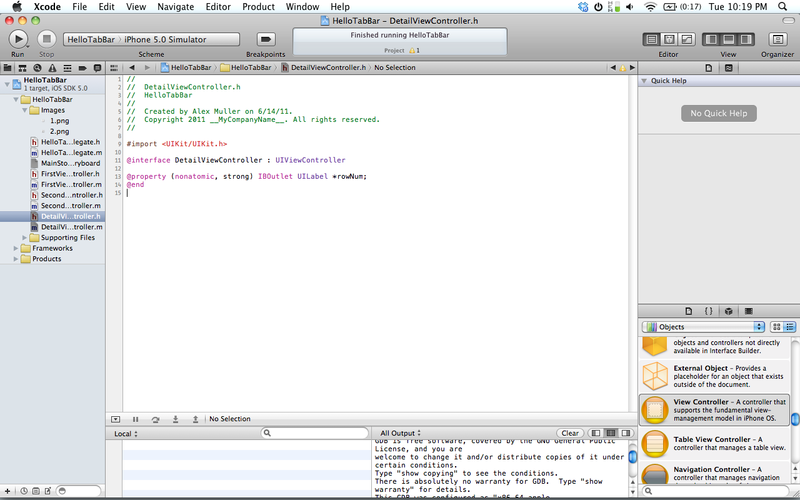 You should set your class as a UITableViewDelegate and a UITableViewDataSOurce, if you need help with that message me. Yeah one thing to help people out if you want auto generated methods for the tableview delegate and datasource is to add the protocol after declaring it as a subclass of UIViewController. I’m not sure why someone would not want to do this as those method declarations are pretty long 🙂 Gotta love objective c! Great tutorial, tnx a lot. Hey. I tried your 2nd Tutorial. All is well, but i keep getting this error. The build succeeds, but will not let me preview the table. In your code, what is the reuse identifier called? If you look in the Interface Builder under Attribute Inspector for the cell, the value for Identifier should be that same as reuse identifier. Nice. That worked to clear that up. Now I have a SIGABRT error when I hit the UITableView Tab Item. See below. BTW I will get you a donation by this weekend. Great tutorials. This is more than 80% of what you will always get when you get a SIG error. I would need to see other code to help. If you can help in any way, that would be great. Did you set the delegate and datasource up in the interface builder? Also, check your identifier in the attributes inspector for your cell in the table. Try changing that in Interface Builder and see what happens. Thank you for a great set of tutorials. I am new to Cocoa, IOS, and Xcode. Very helpful and well presented! Thank you so much for taking the time out of your busy school schedule to post these tutorials. I was doing quite well until the end. Everything was working precisely according to your instructions, however I wish there’d was a little bit more detail or a photo at the end of the Table View tutorial, as I’m not certain I did it right. Basically, I selected the object on view 2 and it doesn’t review the detail. I tried connecting the segue view to the navagation controller and view controller, to no avail. Also, it would be great to see the transition from 4.0 to 4.2 for custom views/rows, adding and deleting rows. I’m glad you enjoy them. If you look at the bottom of the post, you will see a video that has the app running around the last 30 seconds, and also there is a source code download that might help. If not, post a problem here and I will do my best. Happy coding! I am trying to get two tabs working with my text fields and buttons inside. I don’t know if you can help me. I used the tabbed template. Didn’t delete the second view. I think I am ok with the setting up of the text fields, buttons and such. When I run it I am still seeing the demo, not my tabbed views. I am missing something. Thanking you in advance for any help! What am I dragging Table View to? I started over from scratch and dragging from the table view (blue rectangle) to the View Controller – Table View (yellow sphere in the dock) worked first time. I must have fumbled something before. Is anyone else having this problem: Yesterday I posted code I couldn’t get to work. I followed 5 different tutorials. 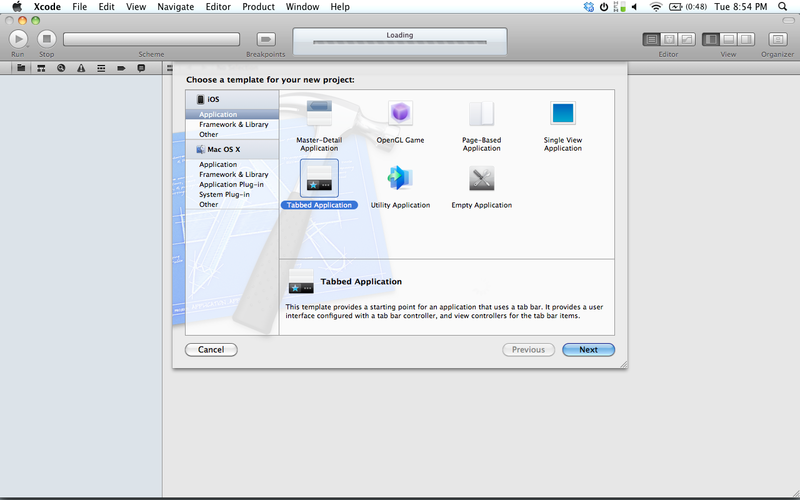 I closed Xcode… simulator several times hoping to clear it out. No changes. Today I sit down never rebooted. Follow your tutorial to the tee. It worked. Then I thought I know I did the same thing yesterday. All 5 worked today. This morining I was adding a bit to it. The same thing is happening. Not one of the 6 apps run. They show the original dragged in tab bar controller. I have rebooted it, still don’t work. 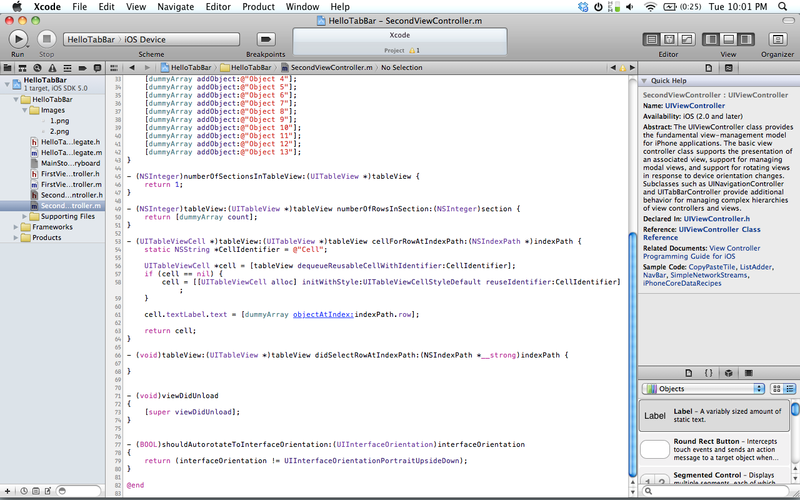 Is it a bug in the new Xcode? Thank you for the solution !!! It took me about an entire day to find your video and 5 seconds to solve it !! LOVE IT!!! The source code is at the bottom of the post. Hey, I’m trying to test run your program and it’s coming up with “Program Received Signal SIGABRT” in the main.m file. I’m running your code exactly as copied from the source file but with different file names. Here’s the code from the file. you are trying to access an array that is in a setup function that is never called. can you provide the source code for downloading please? They are all listed at the bottom of the posts. Can you please help me. I’m new to coding. When i try to run i says build succeed , and if i go UITableView 2 and click on one of Object 1,2,3,4,5,6,7,8,9,10,11,12 or 13 it doesn’t open. It says Thread 1: Program received signal: “SIGABRT”. Can you please help me!I want to do this like a project school.Also I’m new to xcoding.Thank you very much! You can’t set all the cells at once in your didSelect. Thank you for your teaching! This is very useful! What is the reason? Thank you!! You need to give me more information than that. Content is the same with you, but on turning says ” Thread 1: Program received signal: “SIGABRT”. ” I guess the problems on main.m, but I do not know how to solve. Dude, I just want to tell you that this post is what made my app a reality. You’re awesome! (In my post above I meant my next app, not my iMass app. ) Thanks again! It would be helpful if you can come up with a core data tutorial. Basically I am looking at ways to save the data user enters in a form. Also, a UITableView tutorial on how to add a section and then cells using buttons on screen. Like for example a to-do application where the user can click a “Add Day” button and it creates a new section with one entry row and inside the section a + button to add a new to-do item. Nevermind, got it to work, somehow..! hi , i am beginner, i want to do something like , i have a plist data, using this Plist data i would like to create TableView ,detailView of each row . i want to do it in only “STORYBOARDS” ,i tried and tried i failed to find the way . Please Help Me . Dude, I could kiss you right now, I’ve been going all over trying to do exactly what you’ve been talking about and because of this tutorial it all came together for me. THANK YOU SOOOOOO MUCH!!!! Hey great tutorial man, i was wondering though how would you go about pushing to numerous view controllers instead of just the one.﻿ Plz respond really need help!!! Anyway, have a nice day and thanks a million ! Thanks so much for this tutorial – really helped me out! 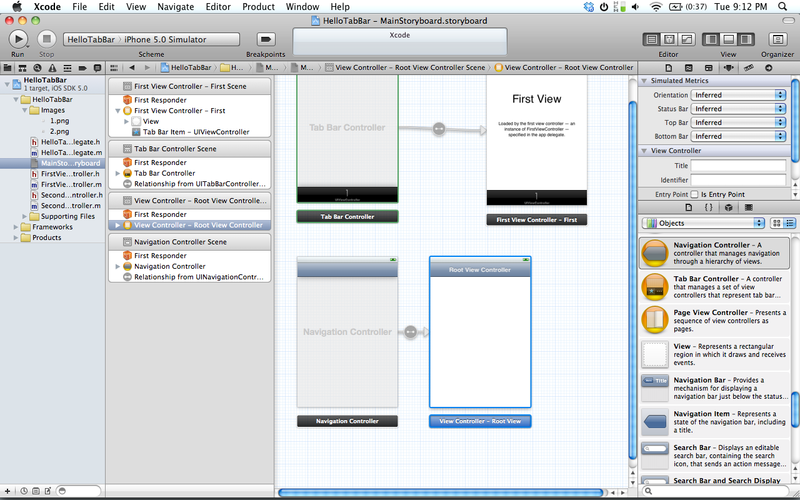 Fantastic tutorial, worked “out of the box” and clarified a lot about how storyboards work on Xcode 4. Well done! Amazing tutorial, and exactly what I want for my app! Cosmetic issue tho, how do I change it so that when the back button is pressed, and it’s back to the table view, the previously selected row is not still highlighted?